The Feminist Caucus of the League of Canadian Poets is pleased to present the panel “Performing Women: Playwrights and Performance Poets” at the Canadian Writers’ Summit taking place this June at Harbourfront in Toronto. Find out more information about the Summit, and the League’s Annual Conference, at poets.ca/conference. Friday, June 17, from 7:45 to 9 am, we will host our breakfast business meeting and open readings. We will be launching the anthology Women & Multimedia: Poetry Collaboration/Elaborations, with work from Di Brandt, Terry Carter, Penn Kemp, Moe Clark, Jude Neale, and Cathy Petch. This anthology is edited by Penn Kemp, and contains papers published in our Living Archives Series. This event is free to members of the League, and may be attended without registering for the Summit. Please contact the League office at admin@poets.ca for more information. Moe Clark will be performing from her piece in WOMEN AND MULTIMEDIA. 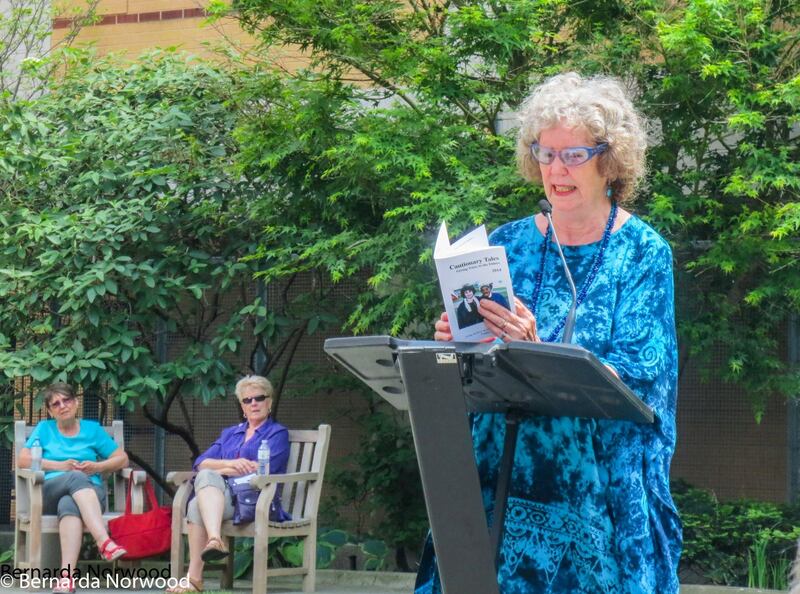 My poem, “Double Vision“, celebrates the Creative Age Festival in London ON! attend to aches in organs hitherto unknown. treating ourselves as well we need be treated. This poem was published in Cautionary Tales: Giving Voice to the Elders (2015) for the League of Canadian Poets Feminist Caucus Archives. The original version of “Double Vision” was commissioned by Gina Barber for the Age Friendly London Report. It was recorded by Dennis Siren on https://www.youtube.com/watch?v=4B8DOIfinOs. 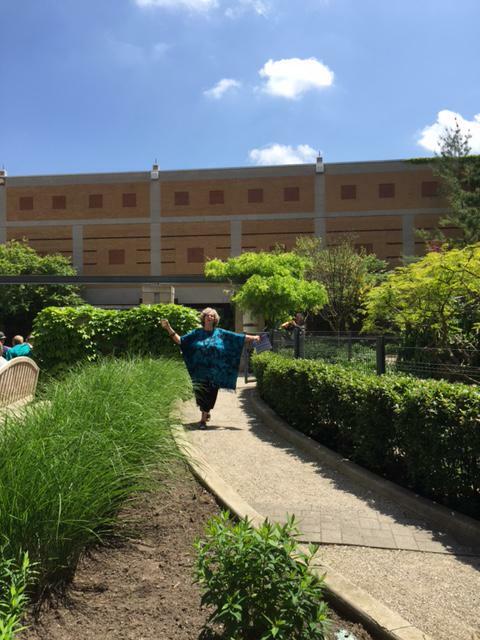 Photos are from Creative Age Festival 2015, in the London Public Library Rotary Garden. What do you hope to get out of the Canadian Writers’ Summit 2016, a conference with writers across all disciplines? What a celebration of Canadian writing in all its forms! Such an opportunity on such a scale is unprecedented in Canada and a terrific occasion for synergy. It will be fun to meet old friends from across the country and to hear and meet writers new to me. What do you see as the role of the playwright within the greater Canadian writing community? Plays written with the local in mind bring that sensibility wherever they are performed across Canada, so that we get to know each other better, experiencing different communities and perspectives in their public expression. The particular becomes universal. I’m closely tied to the idea of collective in writing and co-creating plays. For me playwriting is an interactive political act as the actors are so immediately present and engaged with the audience. The stage offers a chance for dialogue among opposing personalities, forces, themes, opinions: that’s what makes up a drama. You will be speaking on the Performing Women: Playwrights and Performance Poets panel on Saturday, June 18th. How did this panel come together? Every year, the Feminist Caucus of the League of Canadian Poets publishes a chapbook. At the annual League meeting last June, I suggested the topic, Women and Multimedia, and agreed to edit such a work. Ideas proliferated so quickly that it soon became apparent that we’d need another anthology: Performing Women: Playwrights and Performance Poets, for which I put out a call. What started off as chapbooks soon expanded to 70-80 pages each. The two anthologies I edited will be launched at the Summit. See www.poets.ca/feministcaucus. We are also hoping to produce a CD, Performing Women, from the panel proceedings. Our project is a joint venture between Playwrights Guild and the League of Canadian Poets. How wonderful to see the close and keen co-operation between our writers’ organizations in supporting both the panel and the anthology— a collaboration to be celebrated in itself! 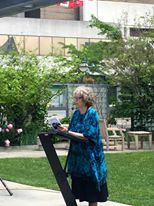 With thanks to Anne Burke, chair of the Feminist Caucus and publisher; the League of Canadian Poets staff; and Robin Sokolski from Playwrights Guild of Canada: they were midwives to this anthology. Tell us about the anthology you’re launching at this event that is being published in the League of Canadian Poets’ Feminist Caucus Archive series. Here’s an anthology that surges with energy to create a resonating concert of variety and scope. These pieces are not just lifted off the page: they are singing, dancing spheres of possibility, sparking new connections. So many threads weave through the works. With titles like these, how could you not read on? Such a moving tribute is one of the most profound ways of stirring folks to take action for change, however it manifests. The line between actor/subject and audience dissolves in a sense of our mutual humanity. I believe that such shared participation is a core purpose of performance art, whatever guise it takes. Performance of necessity demands a wider exploration and communication of the subjective self, as it expresses itself in the world with other people and/or other mediums. How does collaboration enhance and expand a single artist’s vision? With that sense of inquiry in mind, I called for playwrights and poets to explore the topic of women performing. Three of our contributors are primarily Spoken Word poets. It is fascinating to read how these women have expanded the possibilities of performing to include ritual and visual references as well as the resonance of sound. Performing Women: Playwrights and Performance Poets can be read along with the Feminist Caucus anthology Women and Multimedia. All but one of the contributors to Women in Performance are also members of the League of Poets, so their work fits in beautifully. For even more synergy, take a look at these poets’ essays from Women and Multimedia: Poetry Collaboration/Elaboration: don`t these titles entice you to read on? Performing Women: Playwrights and Performance Poets is available from http://www.poets.ca/feministcaucus/ and the copyscript program of the Guild of Canadian Playwrights, https://www.playwrightsguild.ca/about/programs-and-services, Contact orders@playwrightsguild.ca. 5) People are perhaps most familiar with your work as a poet, especially in your capacities as the inaugural Poet Laureate of London, Ontario (2010 – 2012) and your Life Membership in the League of Canadian Poets. What drew you to playwriting? How influential is your poetic work on your playwriting? How do you balance your roles as poet, performer, and playwright? All of my plays have begun as poems. In poetry, I can succinctly express the essence of my preoccupation in concrete lines that can then be drawn out, teased into different voices and displayed more elaborately on stage. My first concern is always with language itself, how a voice finds itself. I was drawn to playwriting when I started to hear voicesJ that grew more insistent as a theme developed. These voices erupted into dialogue and the conversation continued. Poetry is a fireball; sometimes it radiates out in different expressions into different characters. Writing poetry is a necessarily solitary pursuit. I’m my own editor. But in plays, I depend very much on collaboration, even while the script is in process. I’ve worked with brilliant directors like Anne Anglin and Louise Fagan who have more of a dramatic sensibility than I do. They can visualize and enact the narrative thrust and arc of the drama. They can imaginatively realize the action on stage in ways that I don’t. Sometimes, one form demands to be and experienced from the different perspectives of other art forms: a performance, a monologue, a drama. As an activist and Poet Laureate, I was able to draw attention to local and global issues in the community. When a poem can not contain such imperatives, I turn to plays or what I call Sound Opera. This is a collaborative form I developed in performance and recording over the last four decades, in a desire to lift poetry off the page to the stage. Our first performance, directed by Anne Anglin from my book, Trance Form, was in 1976 at Harbourfront. Sound Opera is based on text but it expands poetic possibilities to include voice, music and movement in expressing narrative when emotions burst the seams of print. Anne also directed my play, What the Ear Hears Last, for Theatre Passe Muraille: a translation of my long poem, When the Heart Parts. The latter is also a Sound Opera! The focus is different on stage. When I write plays, I am thinking politically and publicly about some topic that vexes or intrigues me. I am taking a position and attempting to persuade and to present different views. For example, my first play, ANGEL MAKERS, presented the first play dealing with abortion in Canada. Though firmly pro-choice, it presented the complex experiences of the six characters. My first radio play, BEARING DOWN, portrayed a woman in labour and its aftermath in a long sound poem on a subject that had not been articulated. What the Ear Hears Last is about a man dying in hospital, another subject that was at the time taboo, developed as well from a sound poem. Thanks for the opportunity to articulate my writing process! 6) In a 2014 interview with Stan Burfield, you speak in great detail about your love of world mythology. How does that love translate itself into your playwriting? Certainly my first play is based on fable and fairy tale. The Epic of Toad and Heron was created as a protest when Toronto Islanders were threatened by Metro with eviction. Instead of buttonholing Torontonians in protest, I chose to write a play that was first performed on the Island (and subsequently in schools). Even now my hero, the flying Toad, is proudly displayed on the Toronto Island flag. Mythology for me is closely connected to the poetic spirit, where archetypes can dance more abstractly than on the stage. Perhaps my connection to mythology in theatre comes through my love of history and history’s resonance in the present. My latest play presents a Victorian woman, Teresa Harris, who marries to leave her colonial life in London ON, much as I did a century later. How does her life correspond with and differ from my own, or yours? Another long poem, ANIMUS, had its own narrative arc that director Anne Anglin and I developed into a play, EROS RISING, Theatre Passe Muraille. It is also a Sound Opera, Re:Animating Animus . The recurring theme in both Sound Opera, poem and play is the myth of Eros and Psyche. That archetype is apparent in each title. 7) Do you have any advice for aspiring playwrights? What advice do you wish you had received when you started writing? When I started writing for theatre, it was 1975, and Canadian theatre was just coming into its own: a very exciting time that allowed for theatre to break down the fourth wall. I came of age in the flaunted Sixties, so capitalism was anathema to me if we were going to change the world. It would have been useful through the years to realize that a more pragmatic approach was necessary if I were to support myself as a writer into old age. My way was to lower my standard of living through the decades since! I think young artists are much more aware of the practical business demands of getting the work out there: the necessity of promotion and marketing through the present avenues that social media offers. So, aspiring playwrights… Let that spirit of the Sixties expand the possibilities of theatre. May collaboration replace competition. Throw caution to the winds and keep the doors open to let that fresh air blow through all your preconceptions of what theatre can be. But keep your business savvy. 8) What’s next for Penn Kemp? This summer, I’ll be preparing several plays, Eros Rising and The Dream Life of Teresa Harris for the copyscript program. And hanging out in the garden. March 2017 will be a busy month for me! Forthcoming then is a new collection of poetry, Barbaric Cultural Practice, from Quattro Books as well as a play, The Triumph of Teresa Harris. I’ll be working on this play after the Summit… trying not even to think about it till then! But it’s an exciting project. Eldon House Heritage Museum and The Palace Theatre in London have asked me to develop The Dream Life of Teresa Harris, an earlier processional play I did at Eldon House, into a two full act production for the Palace Theatre, with ten actors and the original two musicians. Teresa Harris was the youngest daughter growing up in Eldon House. She became one of the greatest explorers of the Victorian age, but her character is complex and contradictory: she remains a woman of her times. A fascinating project that once again began with a long poem. More updates are on www.pennkemp.wordpress.com and https://www.facebook.com/Penn-Kemp-126450531030/ as well as https://twitter.com/pennkemp. See you there! that settlers burnt to clear their land. on a hillside of younger upstarts. where October puffball might pop. like winds that wind along each limb. all those saplings vying for light. Pine, Balsam Fir, Juniper or Cedar cone. Sing a litany of names that belong here. Alder, Balm of Gilead, Willow galore. Elm, even intrusive Buckthorn now. at comfort’s edge in Snowbelt country. or Le Douanier paint above his lion.